NATURAL HABITAT AND PREFERRED SITE: Escarpment live oak grows in the same area that the coastal live oak grows but also further inland and north and in more rocky alkaline droughty areas. 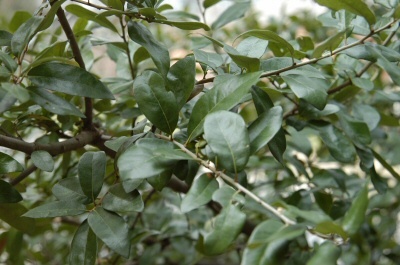 IDENTIFICATION INFORMATION: Live oak is a dramatically beautiful evergreen tree with a wide rounded head. Limbs tend to dip and sweep in all the way to the ground unless trimmed away. Single and multi stemmed trees exist. FLOWERS AND FRUIT: Rust colored male flowers that hang from the terminal growth in the early spring along with female flowers that bloom singly or in clusters. Fruits are one seeded black acorns. BARK: Very dark colored, smooth and gray or off white when young, becoming heavily textured and very dark with age. Live oaks and blackjack oaks probably have the darkest bark of all the oaks. FOLIAGE: Small, glossy, thick, evergreen leaves that vary considerably in shape and size, 1 to 3 inches long, ½-1 inch wide. 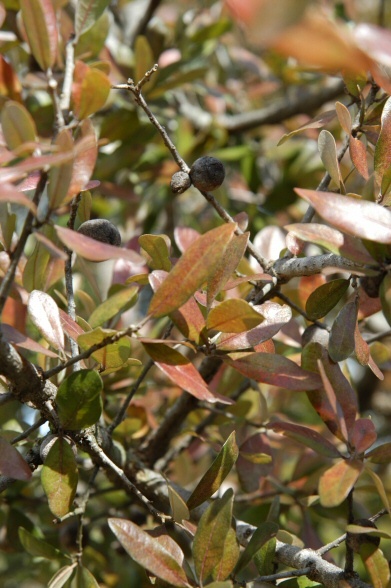 CULTURE: Live oak is easy to establish and easy to grow but is a relatively high maintenance tree because it’s dropping something year round - leaves, flowers, or acorns. Most people have the misconception that it is a clean tree because it is evergreen. It responds well to ample moisture and fertilizer but over fertilization can bring on various pest problems including root fungal diseases. PROBLEMS: Aphids, ice damage, galls, oak wilt and almost continuous flavor, leaf, acorn drop. It has to be considered a high maintenance plant on most urban sites although it is a very important tree for Texas. Another possible problem is freeze damage. During the winters of ‘83 and ’84, hundreds of thousands of live oaks were killed or severely damaged from the prolonged temperatures below freezing. PROPAGATION: All oaks are grown from seed as soon as they are released from the trees in the fall. INSIGHT: The escarpment live oak does seem to be considerably more drought tolerant and cold hearty than the coastal live oak. Both live oaks lose their foliage in the spring when the swelling buds push them off. Live oaks often look bad at this time and worry homeowners that their trees are in trouble. The new leaves emerge quickly and everyone calms down again. NATURAL HABITAT AND PREFERRED SITE: Grows only from central Texas south to the Gulf Coast. It likes more rainfall and soil moisture than the escarpment live oak. IDENTIFICATION INFORMATION: Coastal live oak is an extremely dramatic and beautiful tree with a wide or graceful head. Large limbs tend to dip and sweep to the ground. On some of the most beautiful live oaks in the state, the limbs actually rest on the ground. It is an arborilogical crime to prune away these wonderful limbs. FLOWERS AND FRUIT: Rust colored male flowers that hang from the terminal growth in the early spring, along with female flowers that bloom singly or in clusters. Fruits are acorns. BARK: Smooth and gray or off white when young, becoming heavier textured and very dark with age. FOLIAGE: Has slightly larger foliage than the escarpment live oak. Small, glossy, thick evergreen leaves that vary greatly in size and shape. PROBLEMS: Oak wilt disease can be controlled by using the Sick Tree Treatment and improving the immune system of the tree, improving the health of the soil and the root system. INSIGHT: Coastal live oak is much more sensitive to extreme cold temperatures than escarpment and was the one tree primarily destroyed during the freezing weather of the winter of 1983 and 1984 when we had over 12 straight days of freezing weather. Live oaks grow the best in well-drained soils but can tolerate moist soils as well. Live oaks are curiously tolerant to construction around their root systems. ANSWER: It sounds as if the tree had a weak root ball. All you can do at this point is stake the tree through next spring, then remove the stakes and see whether the tree survives. Use Garrett Juice or aerated compost tea as a drench for root stimulation.Using a product called Super Bio S.I. also could help.